I was so thrilled to complete my 2010 December Daily that I turned the design into foundation pages (digital templates) for 2011. I've not yet chosen the kit I'll use along with the pages, but I have a couple of weeks to get that sorted out! I'm also thinking I won't pre-number the pages, but rather select the page with the best number of photos for each day. In February 2011, I ordered my finished 2010 December Daily book. I used a limited range of supplies and a template/base page design, and if I came up with a page I loved, I just rotated or altered it and reused it. I didn’t do a page for every day and I did more than one page for some days. I’m was thrilled with the result! In 2009 year I faithfully recorded all the details of our December on the sheets that Jessica Sprague provided in her Holidays in Hand class. This is as far as I got with the scrapping though! I did have grand plans to put together my 2009 book at the same time as my 2010 book, as I’ve got the photos and journalling done. But that didn’t happen. Not to worry! I’ve got the paper version from my Holidays in Hand class so it can wait. Or just be in paper form for good. I was so inspired by the whole process that I put together a template album pack so that I can share the page designs with you! I've even coloured the layers in the templates for inspiration! Want to get a head start on your December Daily? Do you feel overwhelmed at the thought of creating a whole album? Do you want to create photo-centric layouts without the fuss of lots of layering? 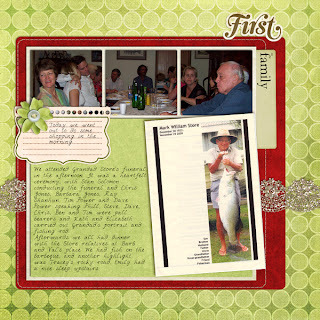 Are you new to digital scrapbooking and ready to start creating pages? I've created just what you need! Check out my 31 templates.